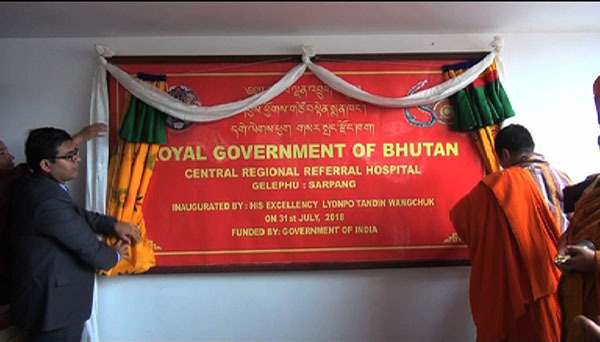 The new Gelegphu Central Regional Referral Hospital was inaugurated today. The heath minister and the Consul General of the Consulate Office of India in Phuentshogling, Ashish Middha, attended the inauguration ceremony. The hospital has 150 beds and is equipped with three operation theatres, an intensive care unit (ICU) and mortuary among others. The old hospital had only 60 beds. The new hospital also has X-ray and CT scan machines, which were provided by Japan. The health minister thanked the Japanese government for that. The minister also thanked the government of India for providing funds to construct the hospital. He said the hospital will not only benefit the people of Sarpang but also others in the six central districts. Consul General Ashish Middha said the completion of the hospital marks another milestone in the history of Bhutan-India relationship. The hospital was built at a cost of Nu 835 M.